This weekend was kind of uneventful. My daughter was the planner of the house this weekend and spent all week planning a movie outing with her BFF, Victoria!! These girls....SMH....only 6 years old and already making plans to hang out with each other. 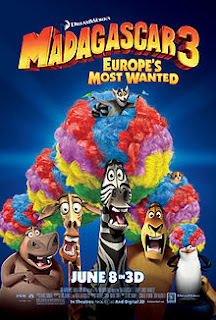 Anyway, she came to me with her big blue eyes, asking if I would take her to see Madagascar 3 this weekend with her BFF, LOL!! So I texted her BFF's mom and we agreed to meet on Sunday at 10am! I always prefer this time since the theater is empty, or so I thought. I didn't realize that this was the opening weekend, so fortunately, I was there early. We got our tickets, soda, slushy & popcorn and headed inside to grab our seats. 10 minutes after sitting down, people began arriving....I have never seen this theater get so full at 10:30 in the morning!! Wow!!! So after 20-30 minutes of waiting, since we were there early, the movie begins. Now I'm not a big fan of the Madagascar movies....actually I can't remember watching them at all! I've seen bits & pieces but it was never a movie I sat down to watch from beginning to end. With that said, I wasn't expecting much and I thought I would be bored but I actually enjoyed it! It was funny, so colorful and the music was great. Kids were laughing, dancing & singing along! My daughter enjoyed every second of it!! I'm really glad that my baby girl planned this little play/movie date....it was fun and since school is almost over, it was nice for her to spend some time with her friend who she probably won't see again until September. I absolutely recommend this movie, it had my daughter's attention for the entire time & that doesn't happen often! !